July is a fun month! I love fireworks, BBQ’s, Camping (sort of) and the best of all the Mr. and I’s anniversary. Lots of fun happening things going on. I love the 4th and everything Red, White, & Blue! So much in love that I’ve teamed up with 110 other bloggers (Thanks to Abbey from The Cards we Drew). That’s not a typo! This is amazing. Seriously, 110 Red, White, & Blue ideas all right here (at the end of the post). I’m always the girl to bring something sweet to a BBQ. Whether it is a Cookie Salad or Red, White, & Blue Ice Cream Sandwiches. Ice cream sandwiches are a perfect cool treat to celebrate the fourth. Better yet they can come dressed for the occasion! A little effort goes a long way with this simple homemade ice cream sandwich recipe. It seems hard, but you will never want to buy ice cream sandwiches again after you taste these. 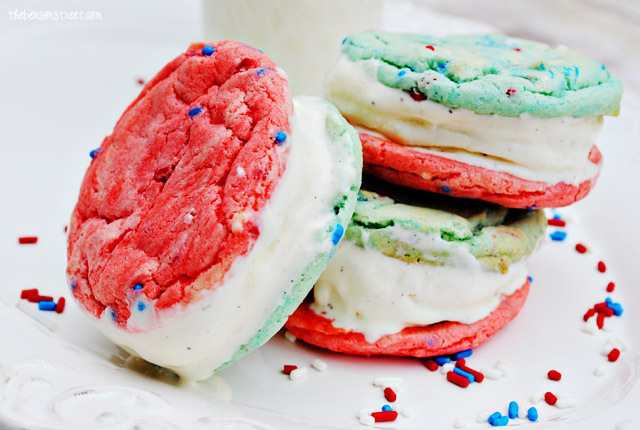 Adding sprinkles to a white cake mix transforms the cookies into patriotic funfetti. Yummy! How do you celebrate the fourth of July? Are you in love with Red, White, and Blue now? Get the recipe here and all the other great Red, White, and Blue Ideas below! Plus here are 110 other great Red, White & Blue ideas from lots of fabulous blogers! Desi, Thanks! They are super yummy! These are amazing. My kids would die if I made them! 🙂 off to pin.